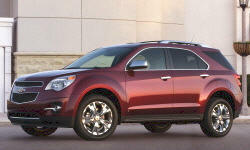 Chevrolet Equinox Pros and Cons | Page 1 of 2 | Why Not This Car? What drives people to buy (or not buy) a certain car? 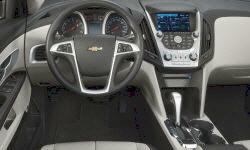 TrueDelta's members share Chevrolet Equinox pros and cons based on their real-world driving experiences. Pretty much the reason for the purchase. Discount and rebates. We have owned this vehicle for 3 years and, so far, remain extremely satisfied. If you pass over looking at the Equinox because of past issues with domestics....you may be passing up the best vehicle for your needs. Front wheel drive bites!!! I have driven them all and they all bite!! Not to bad for grandma driving straight down the interstate, but on a rough, twisty road that are bad. Dangerous is the best word for driving a front wheel drive hard on gravel. Equinox looks good. The earlier version exterior looks sharper the the later remake in my oppinion. The lack of anything close in average mpg to the escape. They always only mention highway milage and shun mentioning average of an awd Equinox for mpg. Also look at ratings for used Equinox on consumers reports for repair history. It was affordable at the time. Lot of room in the console for extra electronics. The bucket seats are at a perfect height for easy entry and exit. Also there is a liftable arm rest between the seats for storing purse, etc. which eliminates the need for reaching to the back when the passenger seat is occupied. No compartments other than glove compartment and center counsel. better than my envoy but not as good as advertised even with eco mode on 100% of the time and light foot, timing lights, etc. Excellent fuel economy with 4 cyl. ; I get the EPA numbers. I got the 4 cyl/FWD Equinox. It gets at or better than the city EPA estimate of 22mpg, typically getting 23-24mpg without AC, 22 with AC on. On the freeway, get 31-32mpg without AC, 29-30 with AC. Best in class, much bolder and "tougher" looking than the RAV4/CRV, and not cheap looking like the Nissan Rogue or the "spacey" Hyundai Tucson. Averaging 27 all around and 30+ on the hwy. With only 550 miles its only going to get better. 4cyl ia an awesome motor..